Still trying to catch up with real life and get the #HackAroundBerlin videos finished. 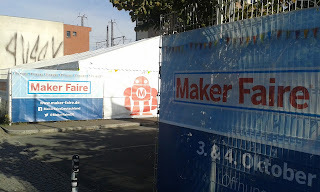 The main reason I was in Berlin was the firm I work for Pimoroni where running a stall at Berlin Maker Faire met lots of exciting makers and maker business with really inspiring projects. This is a quick walk around Maker Faire Berlin looking at stands hosted by Watterott, Elekor, Berlin Raspberry Jam, HackLace and many many more. My #HackAroundBerlin continues with a visit to the Berlin Fab Lab. This place is a product developers dream with a laundry list of high end prototyping equipment, from 3D printers and lasercutters all the way up to a full on CNC mill. Special thanks has to go to the guys at the Space Sylvester, Laslow, Rose, Erick and Murat for making me so welcome. Starting on processing the video and photos from the #HackAroundBerlin. I really wanted to edit and upload video while I was away but I had a major laptop failure lets just say I will have much to say about upgrading to Windows 10 (JUST DON'T). But I'm happily up and running again and will be releasing video as soon as its edited. Berlin is an amazing city and I hope this gives you a taste of Berlin culture and food :) This one is a bit less techie than usual but don't worry the following vids will be rammed with geeky nerd stuffs.